Having grown up with a father who was a chef with his own Italian restaurant, I often had the opportunity to make pizza with him (post here). As a result, I've actually never tried frozen pizza before now. However, when California Pizza Kitchen provided me with a free coupon to try their new frozen pizza recipes, I thought, why not? I already like their four cheese pizza and appetizers at their restaurants, so I figured an at-home option would be fun to try, especially now when I'm not up for much cooking. Their popular restaurant-inspired frozen pizza flavors have also been updated further with new recipe enhancements. More cheese. Unique sauces. New ingredients. Which is why they are now adding the "Our Best Recipe Yet" seal to the boxes, which are hitting freezer shelves now coast to coast. I tried their crispy thin crust Margherita flavor with tomatoes, basil and Mozzarella and Parmesan cheese (suggested retail price of $6.69) and was pleasantly surprised. Next we're going to try their BBQ Chicken flavor. 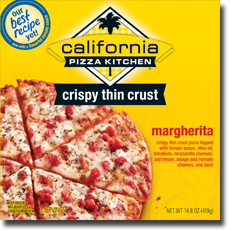 Want to try CPK's new frozen pizzas for yourself? I'm happy to be giving away two free pizza coupons valued up to $14.80 to a lucky reader. Just fill out the form below. a Rafflecopter giveaway Good luck!